Wednesday was a day without obligations and the to-do list was composed of things that could wait. With a bright blue sky and puffy white clouds, I decided a visit to the Museum of Fine Arts was just the thing for the day. Traffic was fairly heavy and I was glad the rain from the previous day had left us with puddles in the driveway but no new additions. 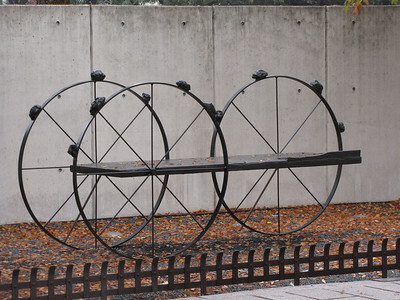 I parked along Bartlett (I can remember this street because it is the kind of pear that I like) and walked through the sculpture garden. I miss the matchstick man but he was just on loan and new sculptures periodically appear. 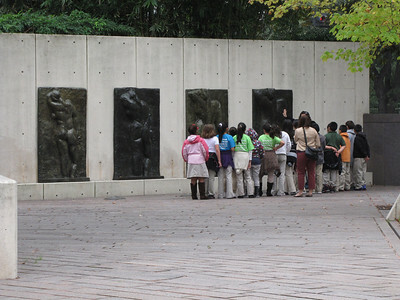 A large group of students–sixth graders I would guess –were looking at my favorite set of sculptures–Matisse’s backs. 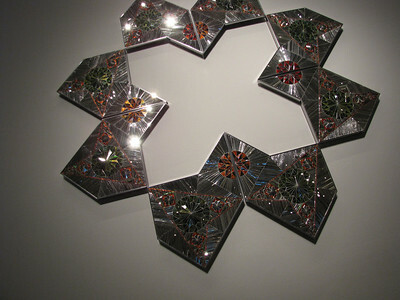 Entering the museum I was immediately struck by some mirrored pieces on the wall. The artist is Iranian and born in 1924. 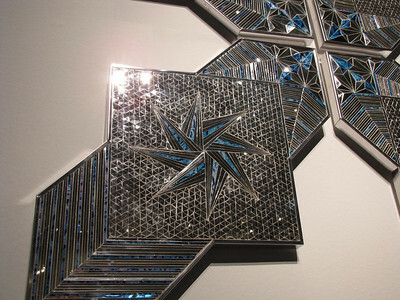 Although the artwork is non-figurative and geometric, it glittered and sparkled and appeared part of the holiday joy. Each piece consists of thousands of tiny pieces of mirror or glass, some is painted behind and then glued on some sort of backing. I wondered exactly how heavy these things were and surreptitiously took a photo of parts. War in Photography was the featured exhibit but I skipped it in favor of the exhibit called American Made–American artists with works ranging from Paul Revere’s silver to Charles Osbourne’s patented water color set to Sargent’s portraits to Childe Hassam’s rainy days in New York and so forth. It was an extensive exhibit and marred only by the lack of seating to sit and appreciate. Henry Tanner was a side exhibit connected to this exhibit. I had never seen his work before but was impressed by the volume of work. Much of his work illustrated scenes from the Bible but with the exception of the table and chairs for seating of Jesus and disciples were new interpretations. He experimented with media, often combining and then adding glue to make his pieces thick but not as sculptural as later artists. A bowl of potato soup at the Cafe Express ended my day.